If you want to learn to dive South Devon is a really good place to do it; we have easy access to some of the best diving in the country. Our Come and Try It (CATI) sessions are a great way to help you decide if diving is for you and to begin your diving adventure. This pool based session, with one of our experienced divers, will introduce you to the equipment, to the skills and to our club. You can find our more information using this CATI link. 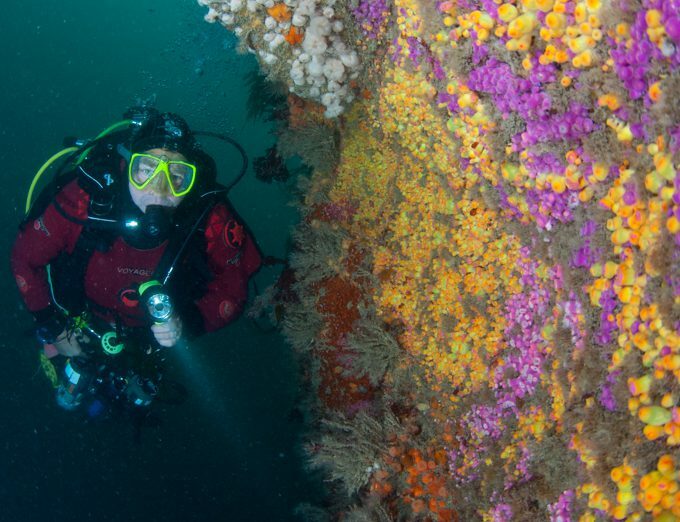 The Ocean Diver course develops your confidence and competence in a sheltered water training area – a swimming pool – and then introduces you to open water diving – in the sea – all under the supervision of trained BSAC instructors. The course involves some 6 hours of theory instruction, 5 hours of pool based sessions, followed by a similar amount of time diving in the sea . Ocean Divers are qualified to dive to 20 meters, under supervision. Pool training takes place at Totnes Tadpool and classroom sessions at Meadowbrook Community Centre in Dartington. The total training generally takes up to about 9 months to complete, but is obviously affected by the amount of time that you can commit and the weather. Open water training takes place at weekends and some weekday evenings and you must be prepared to commit a fair amount of your free time to training during your course. You can find more information about the course on the BSAC website, using this Ocean Diver link. We have just started our January 2019 course so will not be recruiting again until next year. We are likely to hold an Open Evening in November 2019 when we will be providing more information about the club and our Ocesan Diver course. In the meantime you may wish to do another try dive (CATI), or if you want to know about other ways of learning to dive drop us an email: totnes.diveclub@gmail.com.